These four paintings, created as part of the QU4RTETS project to illuminate T.S. Eliot’s Four Quartets, have many layers of meaning and nuance and are meant to be viewed in conjunction with the entire project. However, they also stand alone as a profound visual meditation on the seasons of life. 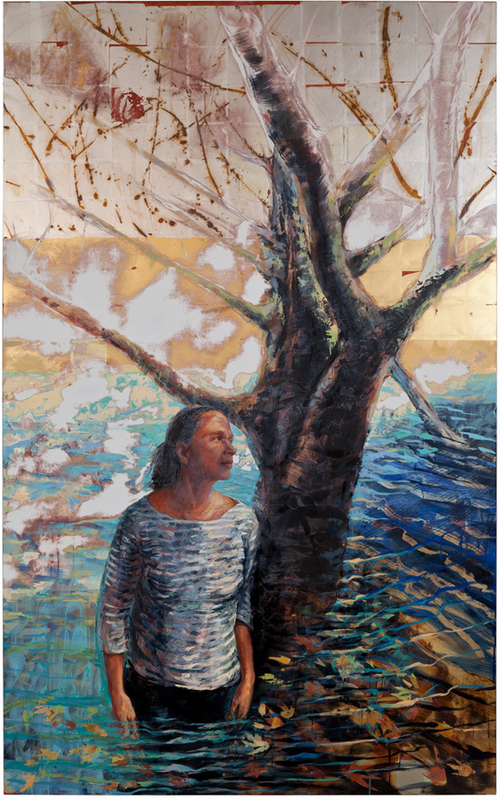 Bruce Herman uses repeating motifs, such as figures, a grid, and a tree, to give his paintings a greater conceptual depth than the standard seasonal metaphor for life. The first painting, Childhood, is bubbling with green and gold. The composition shoots upward, drawing the viewer’s eye to the young boy who stares right back. This paintings has the most clearly defined light source, which filters through the branches as a series of squares. The boy could either be seen as frightened as he rides the crest of growth exploding upward from the earth or as audaciously curious as he looks down from his high vantage point, or perhaps some combination of both. 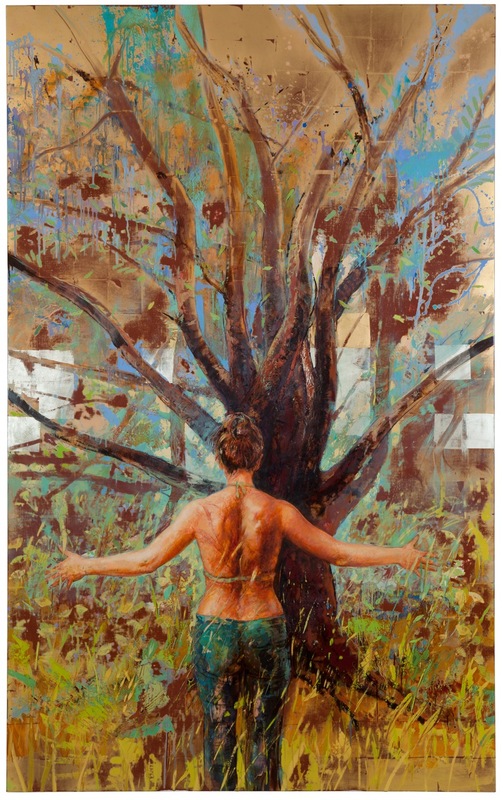 In the next painting, Youth, a young and attractive woman stands with arms outstretched, seeming to bask in the heat radiating from the bonfire of a tree before her. The composition is a riot of reds, oranges, and golds that seem to flicker upward like sparks. The woman has no interest in what is going on outside of the canvas; she is wholly transfixed by the energy before her. A grid, barely visible, emerges from between the twisting branches. This painting contains all the zest and passion of youthful vision. The woman can be seen as a symbol for youth, but she also functions as a representation of the desire for the possibilities that seem just one step away. Her intensity mirrors the single-minded optimism and focus of one set on making their way in the world. At this stage of life the grid, the big picture or the reason for things, is obscured by the chaos of possibilities. Before the woman is the element of fire which has risen from the earth and is waiting for her to shape and be shaped by it. In Adulthood a woman stands waist deep in water beneath a tree shedding its leaves. Her shirt mirrors the ripples spreading out from her. Her posture is slightly bent under the weight of life and the whole composition presses down and flows outward through the ripples. The woman has turned from her all-consuming focus of the tree and is looking outward with a somber expression. Perhaps the tree, as a symbol for her life or her work, didn’t turn out the way she planned. It seems to be dying or changing, and its leaves drift away from her on the ripples made by her presence. The brown of dead branches only appears where the silver grid has descended, as if her increasing understanding is putting to death everything in which she was so confident. In many ways this painting feels more somber than the following Old Age. The optimism of her youth has been tempered by an awareness of her own fleetingness and inability to control life. While seemingly bleak and mono-chromatic, Old Age is full of quiet hope and peace. An old man with a silvery halo gazes contemplatively at the viewer. Behind him, a full-grown tree is visible through a silver veil-like grid. The old man’s gray hairs are his “crown of glory” and the halo is a traditional art symbol of those who are holy or righteous. He stands as a sage or prophet beneath the tree and seems to be ready to answer any question. 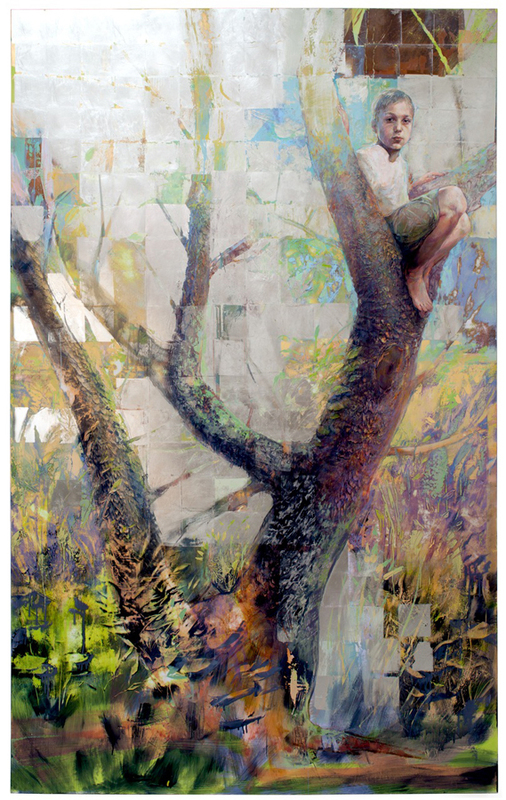 The tree is full grown and its trunk reaches higher than the trees in the other three paintings. 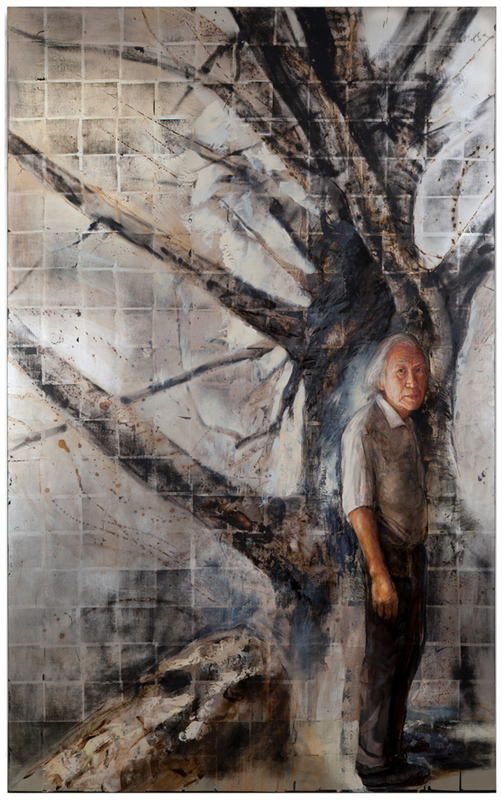 It is a tree that has been “planted by streams of water.” The grid in this painting is complete, suggesting that the old man is beginning to see something of the structure of his life and the world. Discovering one’s self is not something that can be accomplished with an internet questionnaire. It is only when one has reached the end of their life and can look back at all the decisions, events, and places that constituted their existence that they can truly know what kind of person they were. Bruce Herman’s paintings, like T.S. Eliot’s poetry, are made up of symbolism, nuance, experience, and allusion. Given that these paintings were made in response to the Four Quartets and in conjunction with the other art and music of the QU4RTETS project, it is entirely possible that their chief concept is not the seasons of life as I have described them. However, like all great paintings, their ambiguity arises not from muddled or unclear meaning, but rather layers of suggestive and conceptually connected meanings.